Every time senior Richard Herta stepped onto a sports field over the past three years, he had been placing himself into a dangerous situation. Herta discovered this danger when he went to last year’s Teen Heart Check at Flushing High School. Herta’s heart scan changed his life in many ways. 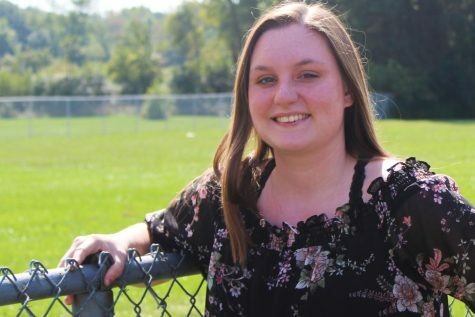 Herta’s experience may seem rare, but the risk is there for all teenagers, especially athletes. Nurse Practitioner Andrea Rossi works at the Regional Alliance for Healthy Schools clinic at KHS. She stresses the importance of getting checked out for any unknown health issues. “You can have undiagnosed heart conditions that weren’t caught at birth that can cause sudden death,” Rossi said. 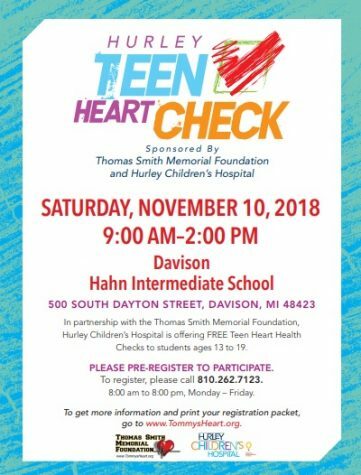 Hurley’s Teen Heart Check is scheduled for Saturday, Nov. 10, from 10 a.m. to 2 p.m. at Davison’s Hahn Intermediate School. The heart check is free and is open to both middle school and high school students. The Thomas Smith Memorial Foundation combined with Hurley Children’s Hospital to sponsor the Teen Heart Check. Their mission is to provide free and early detection and information for teenage heart illnesses. The Thomas Smith Memorial Foundation was created in memory of Thomas Smith, a 17-year-old senior at Flushing High School who died when he went into sudden cardiac arrest after returning home one evening. Thomas had been living unknowingly with hypertrophic cardiomyopathy, which is a condition that causes thickening of the heart muscles. To preregister for a screening, call 810-262-7123. For more information and to print your registration packet, go to the Thomas Smith Memorial Foundation’s website.